Young people have the drive, desire, and guts to make a difference in the world. What they often don’t have is someone who can walk alongside to coach and encourage them. According to the Hemorrhaging Faith report, young people who were supported as they led felt affirmed and found joy in their service. When youth have the chance to lead alongside a trusted mentor, they grow exponentially in the ways they lead and invest in others’ lives. Wasim, one alumnus, now works with Free the Children. Take a look at Wasim’s story. After graduation, his mentor from Inter-Varsity continued to walk alongside him as he made life and work choices. Now, in his work with Free the Children, he is putting leadership lessons into practice. In Korea, Sydney learned new ways of praying with friends. Carrie spends a lot of time investing in the lives of fellow staff at camp. Take a look at Carrie’s story. 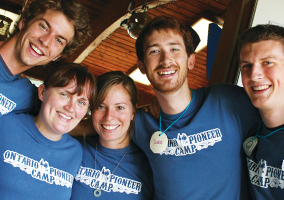 She grew up going to camp and now works at Ontario Pioneer Camp full time. “I get to see people meet Jesus for the first time to challenge them to ask him questions, and to walk with them while they search for him,” says Carrie. When she graduated high school, Ruth passed the leadership baton to her friend Ness. Read the stories of these young leaders, who are investing deeply in others because they have been mentored by those who came before them. “Will Work for Meaning” – Wasim Hossain. 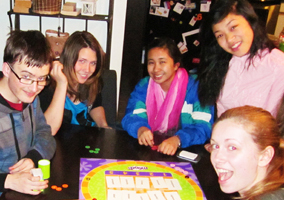 “Bridging Cultures – International friendships lead to deeper understanding of God” – Sydney Archer. “Honest Questions, Profound Answers” – Carrie Baker. “Going Back to High School – University students encourage high school ministry” – Ruth Josue, Agape Karagi, and Ness Medina.